In my last article, I commented on Dr. Jan Chong's dissertation presentation "Software Development Practices and Knowledge Sharing: A Comparison of XP and Waterfall Team Behaviors". I raised some questions about the utility of long-term design documents and provided links to Scott Ambler and Mary Poppendieck's writings about unit tests and automated tests as a form of long-term executable specifications. In this article, I'm going to give a better version of an often heard analogy that "Software construction is like building construction". Usually you hear this when product owners, project managers, or architects say things like, "We can't do that until we've got the foundation in place. Think of a building. You have to have a solid foundation first." To prepare my final point, I present the following two slides come from the Autumn of Agile screen-cast series mentioned in prior posts. 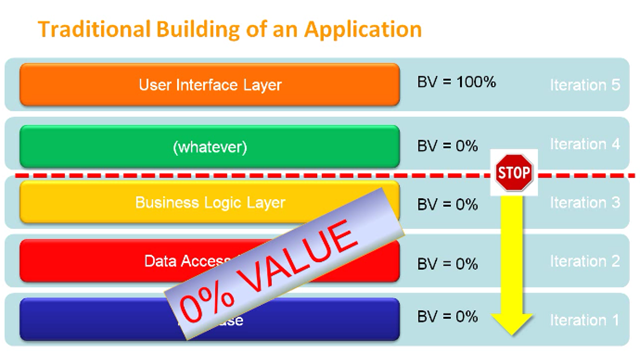 This first slide depicts the traditional sequential waterfall approach to building an application. The main theme is that waterfall projects typically result in teams developing horizontal layers that end up delivering business value only after all layers are complete. This next slide depicts how agile (or simply iterative & incremental) projects develop systems. The main idea here is that features are developed vertically. This means that the features are independently valuable, and can represent a portion of the total desired value at any time should the project schedule get cut short. Let's assume we have 5 total features in the software system depicted in slides one and two. In the first slide, all 5 features are "finished" at the same time when the user-interface is built on top of the lower layers. In the second slide, a single feature is built from "top to bottom" during each iteration. Imagine a team of developers building a neighborhood like the traditional sequential waterfall approach to building software. Let's assume each iteration is 5 weeks for simplicity's sake. After 5 weeks, the developers would have built 5 separate sets of blueprints for the 5 houses to be built. Imagine that these are 5 or more separate parts of an overall software requirements specification in a software development project. They might describe database table schemas, relationships, multiplicities, etc. I'm sure you already see how asinine this approach to neighborhood development is. After 10 weeks of work, our construction company has failed to complete a single inhabitable house. What are we paying these people for? Why are they building a foundation, then moving to the next lot to build the next one? I guess they're just going to get back to it sometime later. This is great, finally. After 25 weeks we finally have inhabitable houses! Actually we had one inhabitable house after week 20, then one more per week until 25. That almost feels like a privilege at this point to get so many houses finished so quickly in succession. Do construction companies ever really build houses like this? Not that I've ever seen. They try to complete a house as quickly as they can after the foundation concrete sets. Of course, that means they may indeed start on a second foundation before they build the remainder of the first house, but you get my point. Suppose it were 30 houses instead of 5. Could you imagine if this were a new neighborhood being built just behind your backyard. What would you think if you saw the crews building 30 separate foundations, then coming back to the first to frame it, then moving to the next to frame it, etc, etc. You'd think they had last their minds or have absolutely no respect or understanding of the Time-Value-of-Money or concern for a Return-On-Investment. As you can see below, our construction crew progresses through each house from "the ground up", which means that they finish one house completely every five weeks. This, in agile terminology, is their velocity per iteration. The learn more about agile teams and velocity, read my article "D = V * T : The formula in software DeVelopmenT to get features DONE". In the following table, we're looking at how many houses we complete per iteration. So, the calculation is number of iterations passed / number of houses completed. Thus, the agile velocity is constant in terms of 5 weeks. We can always count on 1 house becoming complete every 5 weeks. Finally, since we know that nobody can live in a house until it's completed, we can calculate the potential accrued Return-on-Investment (ROI) after each iteration for actually having sold houses. Let's assume we can sell each house for $100,000. Taking into account the Time-Value-of-Money (TVM) we understand that it's certainly more valuable to realize returns via the agile approach to building neighborhoods as opposed to the waterfall method! Similarly, when we talk about ROI and TVM regarding software projects developed using agile methods, certainly we sometimes mean that we can gain monetary returns earlier by producing "potentially shippable product increments" faster and getting them to the market. However, what we also mean is that by focusing on building features top-to-bottom, we can get the complete experience and feedback necessary to then apply toward the next feature and we prevent the pains of having to refactor code later when it's no longer fresh and when requirements have been changing all round. Until next time, stay agile, not fragile!